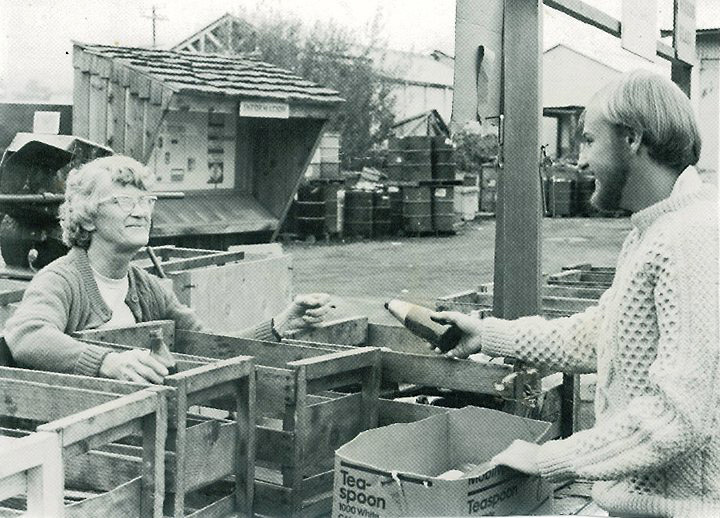 Volunteers help sort recycling at the Arcata Community Recycling Center (ACRC) in the 1970s. Photo from the ACRC Facebook page. Waste management is a crucial and often overlooked part of everyday life. Although the recycling model that has developed over the decades has been far from truly sustainable, recycling has been an important pillar of waste management and environmental consciousness. Humboldt County, and Arcata in particular, has a reputation for being a leader in progressive waste management beginning with efforts to kickstart recycling in the early 1970s. Today, active organizations continue to push for innovative waste management solutions that prioritize the environment. Previously, all solid waste in the county would end up in various scattered unregulated dumps. The main dump , located outside of Eureka on Cummings Road, was privately operated and used the “open burn” method from 1933 through 1969. In 1971, the Cummings road dump became a regulated landfill owned by the Eureka Garbage Company. In 1999, Humboldt Waste Management Authority (HWMA) bought the landfill, closed it within a year, and has since been in charge of rehabilitating the area. Another major local milestone was the creation of a community recycling center as part of the fledgling Northcoast Environmental Center in 1971. This grew to be the Arcata Community Recycling Center (ACRC)—one of the first non-profit drop-off recycling centers in the United States. We might take “blue bins” for granted now, but in the early 1970s recycling operated entirely on a grassroots level. ACRC became a proud staple of environmentalism in Humboldt County during the forty years it was in operation. Value (CRV) bottle deposit was created in 1988 to incentivize recycling, although this fee and other related incentives did nothing to reduce the amount of bottles being used in the first place. Recycling as an environmentally-conscious action caught on at Humboldt State University when the Campus Recycling Program (CRP) was created in 1988. The CRP was a student-run volunteer organization that collected recyclable materials all over campus and brought them to the ACRC. In 2010, CRP evolved into the Waste-Reduction & Resource Awareness Program (WRRAP) which handles many sustainable projects. In 2007, the ACRC built an $8 million state-of-the-art Materials Recovery Facility (MRF) on the Samoa Peninsula, with the expectation that they would continue to process the recyclables that HWMA received, as they had for years at their prior facility. In 2010, HWMA had voted to buy ACRC’s facility in Samoa, but then instead signed a contract to send their recyclables to Solid Waste of Willits in 2011. The ACRC saw this move as an attempt to sabotage their business, which ultimately put them in a position of having to sell the Samoa MRF at a foreclosure price. When Recology, a San Francisco-based company, came to Humboldt, they streamlined curbside recycling collection into a single-stream system, which is more convenient for the public but worse for the quality of the recyclable materials (read more about this issue on page 5). After the forced closure of ACRC, former members created Zero Waste Humboldt (ZWH) to focus on preemptive waste reduction solutions instead of only dealing with the end products. The NEC is proud to have Zero Waste Humboldt as an associate member group, and is also proud of our long history of cleanup efforts to keep waste out of our waterways (read more on page 17). While the exteme proliferation of plastics (particularly single-use products and packaging), single-stream recycling systems that result in contaminated materials, and China’s change in recycling policies, waste management has become an urgent global issue. Humboldt, once driven by the passion of grassroots recycling activists in the 70s, is again leading the way with progressive perspectives on recycling and waste management by focusing on waste prevention. Reducing resource consumtion and eliminating single-use packaging, particularly from long-lasting, toxic materials like plastic, is our only way forward.